Q: When does my fishing license expire? A: Annual fishing licenses no longer expire on the same day as hunting licenses do. They now expire 365 days from the date of purchase or, when purchased up to 60 days in advance, they expire 365 days from the date you request. The expiration date can be found on the license. Purchasers that provide a valid e-mail address receive a reminder to renew their license. Licenses can be purchased at a license sales vendor, online or by phone (License Information). Phone purchasers are provided a sales number that allows them to fish while they await receipt of the license in the mail. Q: How do I measure a fish to make sure it’s a “keeper” that meets the minimum size limit? A: Measure from the tip of the snout to the tip of the tail. The mouth may be open or closed and the tail can be spread or compressed to achieve the greatest length. Use a tape measure or measuring board to determine length. Q: Is my fishing license valid when fishing in saltwater, such as a pier in New York City or on Long Island Sound? A: No. To fish in marine waters (saltwater) or for migratory marine species such as striped bass in waters such as the Hudson and Delaware Rivers you must enroll in the Recreational Marine Fishing Registry (License Information). There is no charge for entry in the registry. 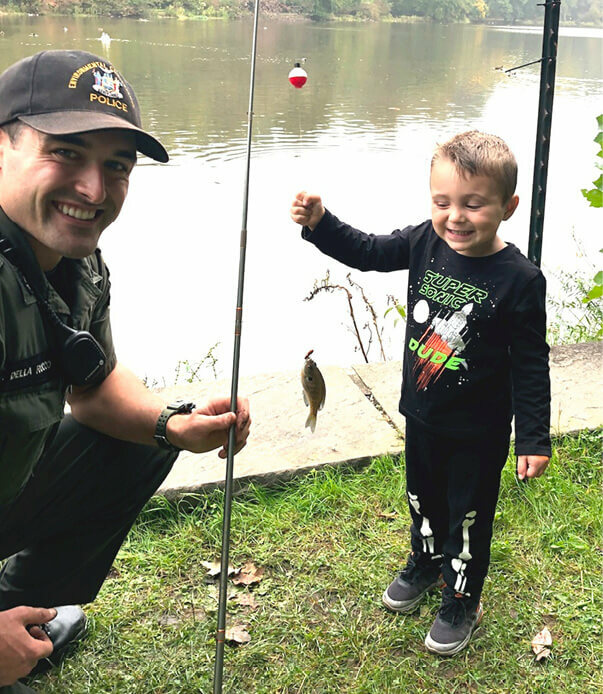 Q: Do I need a fishing license to help a child fish? A: Not as long as the adult is merely assisting a child bait a hook, cast, etc. ECOs encourage youth participation in fishing and exercise officer discretion in such situations. The adult requires a license if they are going to be fishing themselves. Q: I own a camp on a private lake. Do I need a fishing license? A: Yes. A fishing license is required for anyone 16 years of age or older, whether the lake is accessible to the public or not. Q: I release all the fish that I catch. Do I need a fishing license? A: Yes. A license is required for the act of fishing, whether you release the fish that you catch or not. Q: Can I keep my fishing license in my vehicle when I am fishing so it doesn’t get wet? A: You must possess valid proof of a fishing license whenever fishing (License Information). Proof of purchase can now be kept on your smartphone via the new HuntFishNY App (Message from the Commissioner). Q: If I get a ticket for fishing without a license, how much will it cost? A: Most fishing “violations” have a fine ranging from $0–$250 and/or 15 days in jail. If found guilty, the judge determines the exact amount. Q: Who do I contact if I have a question concerning fishing regulations? A: Contact an Environmental Conservation Officer (ECO) if you are unsure of how a regulation should be interpreted. Contact a DEC Fisheries biologist for suggestions or questions on why a regulation is in place. See Environmental Conservation Officers or the “Special Regulations” sections for phone numbers. Q: What methods can I legally use to catch fish in NY? A: Legal fishing methods are described on General Regulations. Q: Can I continue to fish once I have caught and kept my daily limit? A: Yes. However, you must immediately release any additional fish you catch without harm. Q: Can I cull fish during a bass tournament? A: Yes. A special provision for bass anglers allows the replacement of a single, uninjured largemouth or smallmouth bass in a live well with another bass. Q: Can I catch-and-release fish for largemouth and smallmouth bass during the closed season? A: Yes. A special catch-and-release season for bass exists for most waters in New York State, allowing an angler to catch and immediately release bass with artificial lures only. There are numerous exceptions, however, so check the special regulations section of this guide for more information. Q: Can I specifically target a species (other than largemouth and smallmouth bass) if the season or location for that species is closed? A: No. As specified in the previous question, the only freshwater species that may be targeted during their closed season are largemouth and smallmouth bass. Q: If the daily limit for a fish species is five and I keep five from a lake, can I keep five from another lake the same day? A: No. The legal limit is the maximum number of a species you can keep in a day. Some species are grouped together in a species category and the daily limit applies to the total number of fish in that category. For example, you may keep three brook trout and two rainbow trout for a total of five trout in a day, but you may not keep 5 brook trout AND 5 rainbow trout in the same day. Q: Can I use 7 tip-ups while ice fishing? A: Yes. The ice fishing regulations allow you to fish up to 7 ice fishing lines regardless of the device used. Q: While bow fishing, how far from a house must I be to legally discharge my bow? Can I use my crossbow? A: 150 feet. Crossbows are not considered bows and are illegal for bow fishing. Bowfishing is permitted for carp only (General Regulations). Q: How do I report people violating fishing regulations? A: Violations of fish and wildlife laws and other state environmental laws should be reported to DEC as soon as possible at 1-844-DEC-ECOS (1-844-332-3267). Record as many details as possible. A dispatcher will help you file a complaint. ECOs will investigate and let you know the outcome. Q: Why do I need to drain and clean my boat before launching? A: Aquatic invasive species (AIS) have a large impact on our environment in New York State. To help control their spread, regulations require boaters to clean boats of any visible plant and animal material, drain water holding areas and treat their boat by drying or rinsing prior to launching in a public waterbody. Additional regulations for boat launches administered by DEC and NY State Parks require boats to be cleaned and drained prior to leaving the launch. Visit www.dec.ny.gov/animals/99141.html for more information. Q: Do I need my name/address on a tip-up? A: No. This regulation was repealed. Q: Can I use “set lines” or “trot lines” in New York? A: No. These fishing techniques, most common in the southern US, use baited fishing lines which are left unattended for hours or days. They are illegal in New York because our law requires anglers to be in immediate attendance when their lines are in the water. ECO Taylor Della Rocco and a lucky angler with his catch at a youth fishing clinic.